This article is intended to provide a description of the Arab horse from the osteological point of view (detailed in the Appendix), and try to explain how we may do so. We also will try to find what fossil horses have resembled the modern Arabs. It is enough to look at this picture of Abu Zeyd, an Arab horse, to be able to describe him: his elegant proportions, his proud fine head, his long legs are easy to note. The contrast with a common Pony is striking (Fig.1). For archeozoologists and palaeontologists - people who have to deal not with living animals or pictures but with animal bones - the task is to define an animal from them, and somehow get “pictures” of dead animals out of their skeletons or isolated bones. Of course, the shape of a bone keeps something of the shape the part of the body it belonged to. And, of course, a bone shows also characters previously hided by the flesh. Observations and photographs of bones are our first steps. As can be seen on the photographs below of a Pony cranium above an Arab one (Fig.2), the first is overall much smaller; but that is about the single certain information we get; are all of his dimensions smaller, and how much smaller? So, one of the tools we use is osteometry: we measure skulls, bones, teeth, taking their lengths, widths, and depths following a standard method. The raw dimensions of one kind of horse may be compared to those of another kind, for instance Arab bones to Pony bones. Most important are crania and limb bones dimensions and proportions. It is difficult, however, to determine proportions by simple juxtaposition of tables of measurements. That is why we commonly use a technique devised by the great American Palaeontologist G.G. Simpson (1941). Simpson’s ratio diagrams provide rapid and easy comparisons, both of size and shape, for a single bone or a group of bones. In these logarithmic diagrams proportions remain unchanged whatever the absolute dimensions: graphs of two bones differing by their size but identical by their proportions will appear one above the other but on parallel lines. The diagram interpretation is easier when couples of dimensions describing proportions are placed side by side. For instance, relative length and width of muzzle appear directly when the corresponding measurements are placed next to each other. The Simpson’s diagram below (Fig.3) illustrates one way to compare cranial proportions. The Arab cranium is overall larger, so its graph is above the Pony’s one – there is nothing new here. But the graphs segments are not all parallel. Segments almost parallel between palatal and muzzle lengths indicate that their proportions are similar in both crania; but in the Pony, the muzzle is wider, the frontal width is narrower, and the facial height is smaller; these characters are showed by the relative position of the corresponding points: the muzzle width point is upper than the muzzle length point and the frontal width and facial height points are lower. Short body « appendices » - like the muzzle on the skull – are beneficial in cold conditions because they limit deperdition of heat ; they may be seen as an adaptation. Gracile bones are often observed in animals living in dry environments; humid conditions seem to have the reverse effect. An interesting character is the proportion of limb bones lengths (Fig.4). Using the measurements published by J. Clutton Brock and Burleigh (1979) of two modern Arabs, Ajjam and Little Joker, together with our sample of thee provides an average profile for Arab horses proportions. As usual in our Simpson’s diagrams, the reference (0 line) is the Onager – one of the best running adapted equid. The graph for Arab horses is not quite parallel to the reference but rather close to it, while the graph for the Shetland pony is far from it; the metapodials are shorter relative to proximal bones. Ponies are not well adapted for running, Arab horses are. In summary, with the Arab horse and the Pony we have examples of opposite adaptations: the Arab seems adapted to running and living in warm and dry conditions; the Pony looks better adapted to cold and humid conditions and is not much of a runner. We cannot expect to meet fossil horses identical to the Arab or the Pony. But we may hope to find bones indicating similar adaptations. Actually we may even find prehistoric representations of them (Fig.5). On the left the Magdalenian horse of Santander looks more like an Arab, on the right the horse of Combarelles resembles more a Pony. 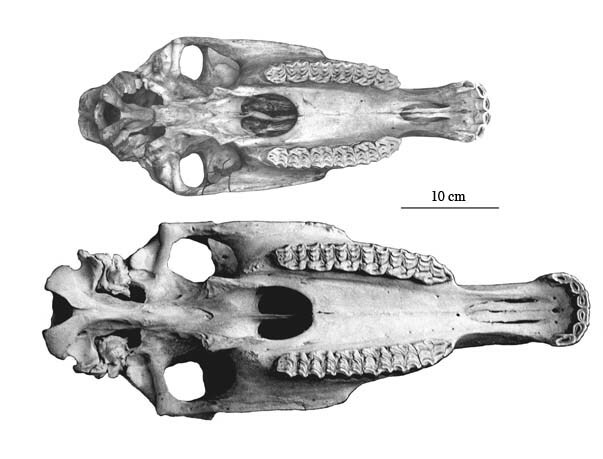 The existence of (at least) two types of horses in the past is confirmed by osteological data. Some Late Pleistocene fossil crania from Italy (ValdiChiana), Spain (E. antunesi of Fontainhas), and Late Bronze Switzerland (Auvernier) have the relatively long muzzle of Arab horses (Fig.6). Other Middle and Late Pleistocene of Russia and Siberia (E. chosaricus and E. cf. chosaricus) and Late Pleistocene from France (E. gallicus, Siréjol) are Pony-like (Shetland, Pottok) by their short and wide muzzles (Fig.7). The limb bone length proportions confirm the existence of “Arab-like” and “Pony-like” fossil horses. For the “Arab-like” pattern there are however some differences (Fig.8). The Tilbeshar skeleton has the first anterior phalanges much longer; the skeleton collected in Egypt by Petrie (included in J. Clutton Brock and Burleigh, 1979 article) has moreover a much longer tibia. “Pony-like” horses are well represented in our fossil sample by E. gallicus (Late Pleistocene of France). That horse had, like some Iceland and Shetland Ponies, short metapodials relative to proximal bones (Fig.9). CLUTTON-BROCK J. & BURLEIGH R., 1979. - Notes on the osteology of the Arab horse with reference to a skeleton collected in Egypt by Sir Flinders Petrie. Bull. Br. Mus. nat. Hist. (Zool. ), 35 (2): 191-200. SIMPSON G.G., 1941. - Large pleistocene felines of North America. American Museum Novitates, 1136, p.1-27, 11 fig., New York. en Equidae monodactyles Equus actuels et récemment éteints ?